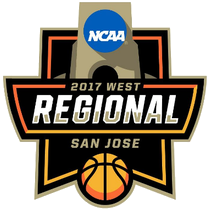 While you decide who will win the tourney, for the 7th year I’m doing the HWCI NCAA First Four for Charity, where I will donate $2 per entry to a charity, this year to IEEE Global Humanitarian Technology Conference, which is the flagship IEEE Conference focusing on innovation, deployment and adaptation of Technology for Humanitarian Goals and Sustainable Development. 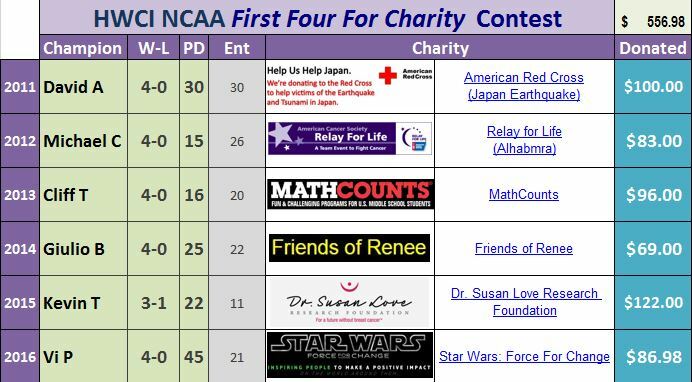 This First Four for Charity is free and you just have to submit (you can comment on this post to enter, email, post to Facebook, tweet @HWCI_Pools) who the four First Four winners will be and by what point margin. For example: Wake Forest by 8, New Orleans by 3, UC Davis by 1, and Providence by 4. 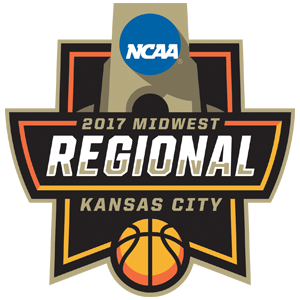 The four games are Kansas St vs Wake Forest, Mt. St. Mary’s vs New Orleans, NC Central vs UC Davis, and Providence vs Southern Cal. Get your entry by 3:40 pm PDT Tuesday. As a bonus, in the end, if we top our record of 161 entries this year, I’ll donate an additional $25. Also, invite your friends and people can enter this charity contest but not our main pool. A few new things this year in the tournament in general — the NCAA released an early projection of the top 16 teams back on February 11 for the first-time ever and the Ivy League now has a conference tournament (though just 4 teams qualify). It’s interesting that much has changed in the top 4 seeds but hopefully UCLA improves on their four seed and hoping USC sneaks in as a First Four team, as they have done well from that position. Now, instead of the Ivy League regular season champion being the first automatic bid in the tournament (if there’s no extra game tiebreaker) to one of the last, as the final is on Sunday (though next year it will move up in the week). This is an early heads-up as after the brackets are released, we will have our 7th HWCI First Four for Charity contest. This is where we took the headache of having 68 teams (instead of 65) and made it into a fundraiser. More than $556 has been donated to six various charities or efforts. There is no fee to enter and you just pick the four First Four winners and margin of victory of each. I will donate $2 per entry (remember, the entry is free and you don’t have to play in our normal $10 pool so friends and family are welcome!) and usually by the end of the tournament, my fellow players will donate a matching set or more! Luckily, no major disasters this season so I’m open to suggestions for charity options. My fallback will be a donation to the IEEE Global Humanitarian Technology Conference — the flagship IEEE Conference focusing on innovation, deployment and adaptation of Technology for Humanitarian Goals and Sustainable Development. For nearly all technical conferences, you have to pay to access papers, sometimes even your own! At this conference, it’s Open Access — that means the papers are free to anyone so that the ideas can be shared with the most people because the goal is IMPLEMENTING the technology to those in need in the fastest way possible (boots on the ground). Until then, Sunday is coming up fast!